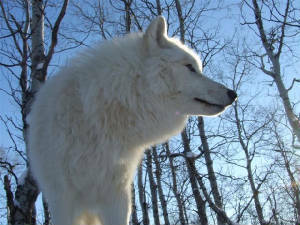 Legends lineage is old and goes directly back to Northern Born, wild, High Arctic relatives. 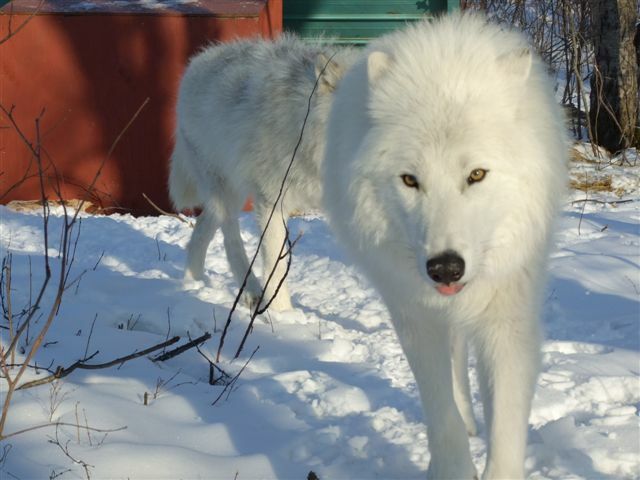 Number of pups born: Arctic wolves tend to have smaller litters, with 3 being average, but have been known to give birth up ro 7 pups. 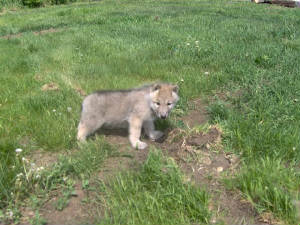 At approx 3 1/2 weeks of age pups start to become more active, and will start to emerge from the den, pups are readily greeted by the entire pack whom will help to feed and care for the fast growing pups. 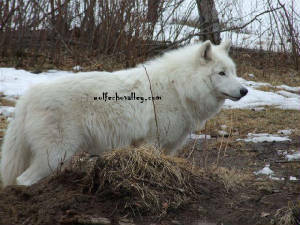 By approx 6 months of age, the pups must be grown enough to be able to keep up with the pack, and are taught more indepth hunting methods via taking part in the hunts. 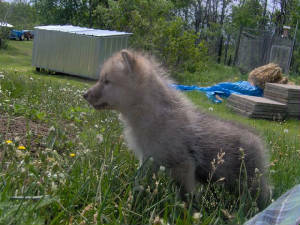 Legend is a very mellow, sweet wolf, aptly nick named as a puppy as buddha baby, and bup bup. 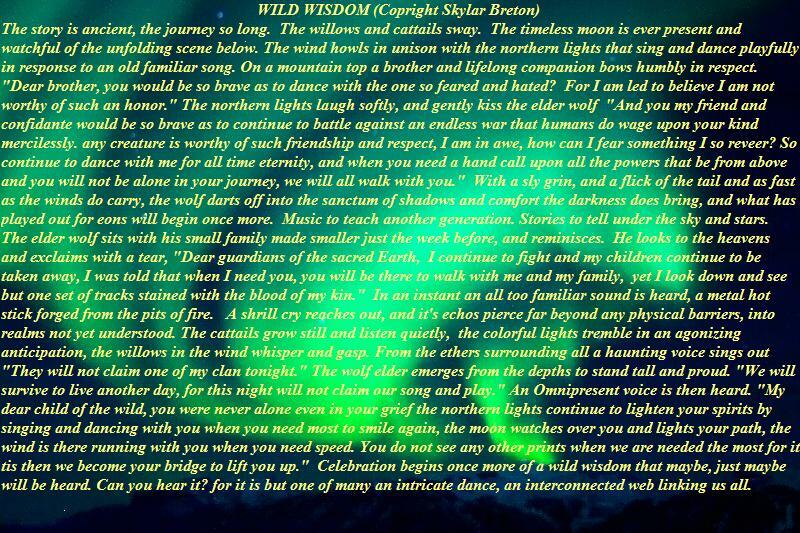 I wrote a poem called Northern Lights Legend due to my fascination and ongoing dance, and love affair with the aurora borealis. 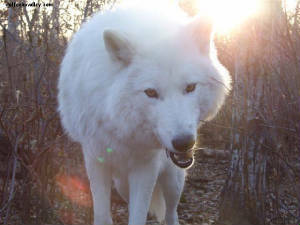 Legend was named after that fascination, and always seems to be smiling. 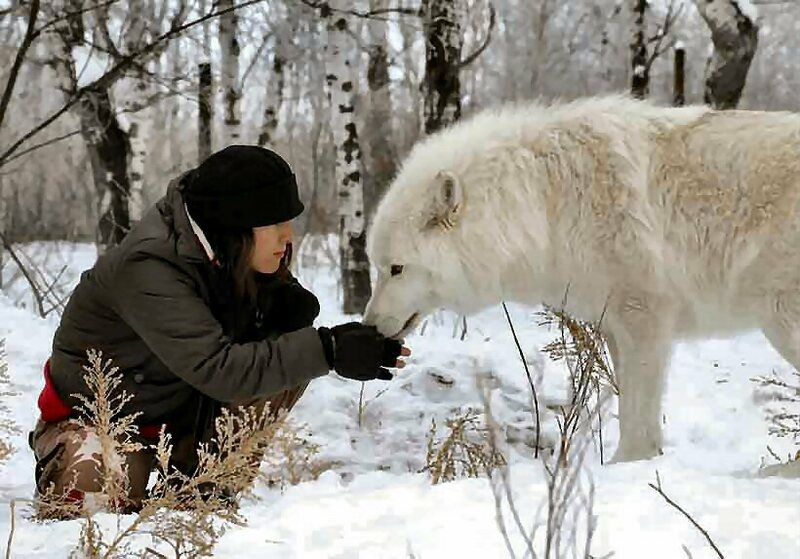 We have yet to come upon a more gentle sweet wolf. 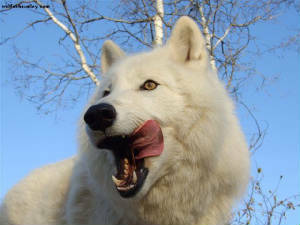 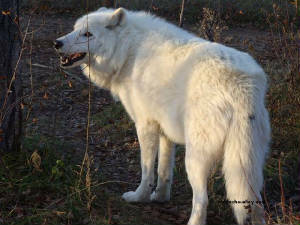 However I also wish to impress upon the public that legend is but one individual and personality among variant personalities that reside within wolves, and even with a bit more tractability, still not a dog, and thus cannot/should not be raised like a dog in the house, nor in ways we train and treat our domestic dogs. 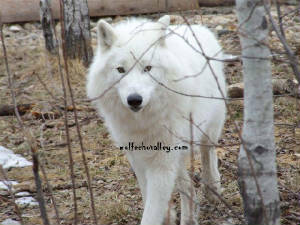 Doing so will backfire on the caretaker(s), in a very negative manner both for the animal, and the human(s). 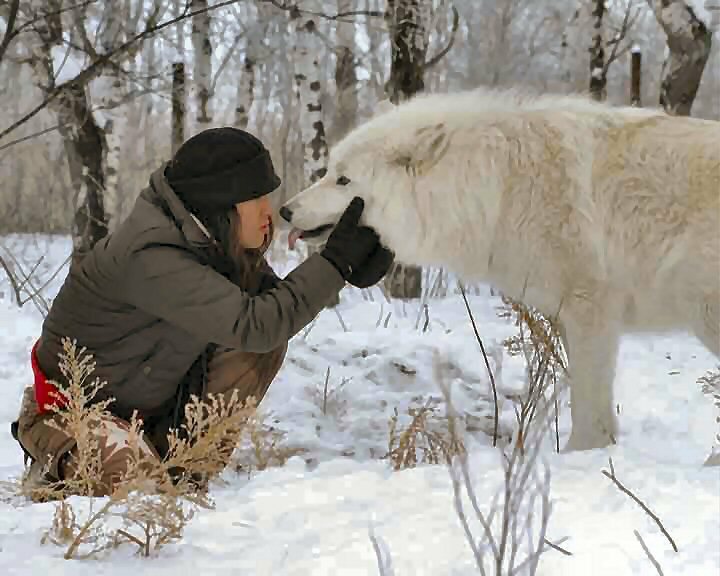 Wolves even captive ones are still wild, and are NOT pets. 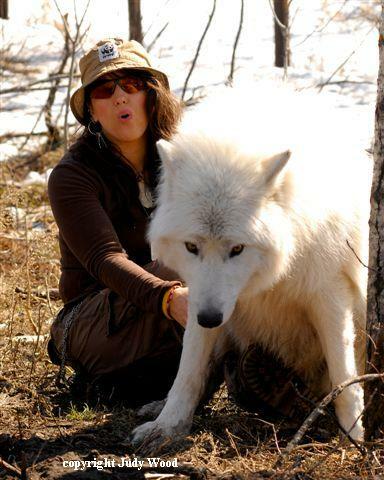 A Wolf Encounter does not endorse them being kept as such. 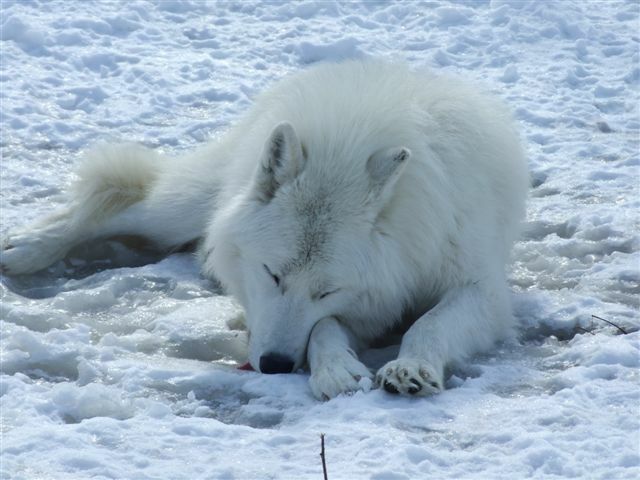 A Wolf even in captivity need to be allowed to be what they are ...wolves. 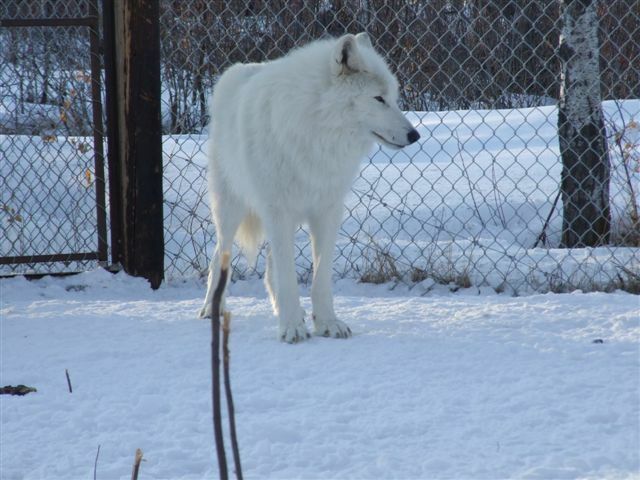 The facility needs to be prepared for the costly containment requirements, (zoo facilities have) have vets willing to work with wolves, as well as understand ALL the psychological, physical, Nutritional needs of such intense and high maintenance animals. 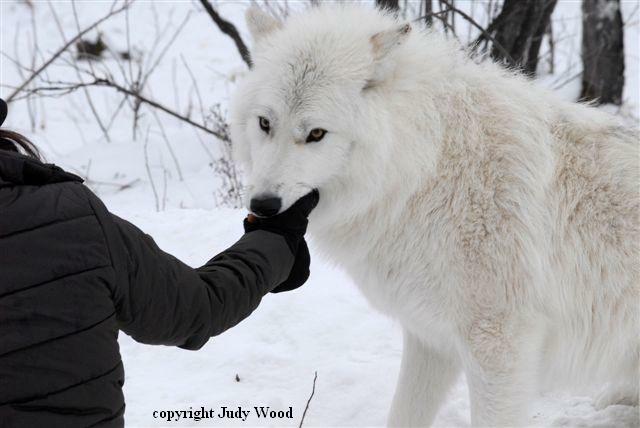 Not to mention if any caretakers get ill are there other trained staff/volunteers/caretakers there to continue adequate care of the wild charges. 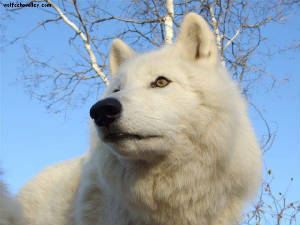 Arctics are never born white, they are born darker and phase out whiter as they age. 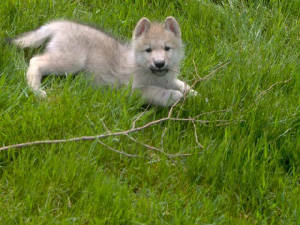 Wolf pups grow up to be large powerful animals and must be respected for what, and who they are as individuals. 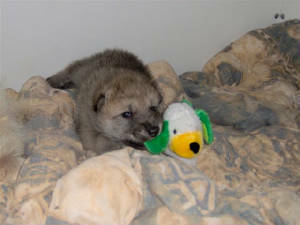 I get asked a lot why wolf pups need to be pulled from mom so young, there are a variety of pros and cons to this, the pros are legend is more safely handleable throughout his life having been socialized to humans, at the same time great care must be taken for him to also be socialized to his own species so he does not over bond to humans either. 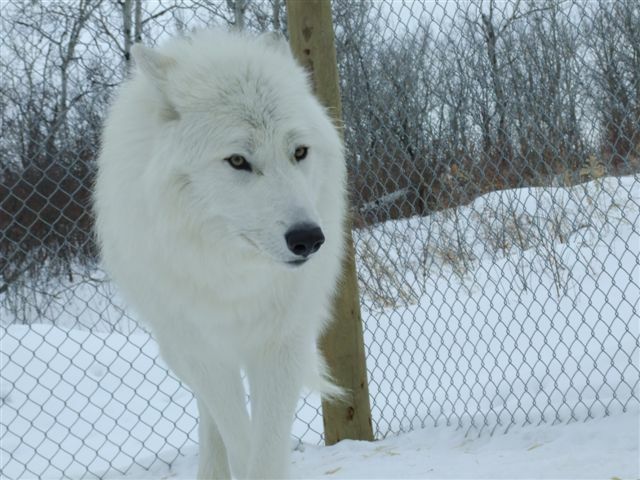 Wolves that are bottlefed from before their eyes open will have a lot less stress in captive situations, which alleviates pacing seen in so many zoo animals of past. 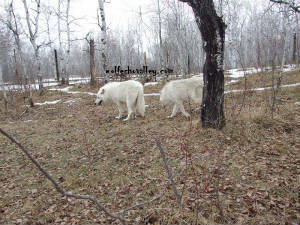 Once old enough approx 4 -41/2 months they are placed with older adult wolves, or with another well socialized trained canine (dog ) for a while longer to be that much more social as adults. 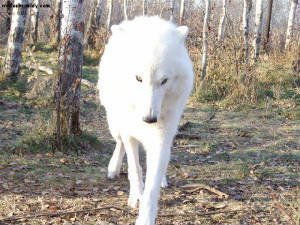 Cons of being pulled away from mom and other wolf adults, are not being reared by their own kind early on, as they naturally would be in the wild. 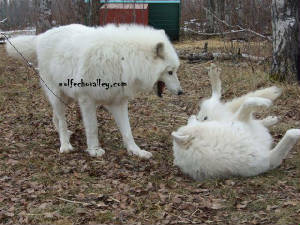 Young pups can be a little more aggressive (nippy) during their normal puppy stages, as they are not taught as well by humans (puppy manners) as they are by their own kind, when left with them. 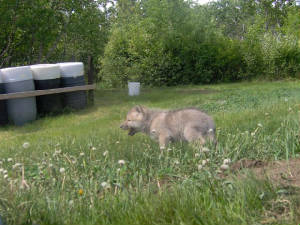 To help make up for this, we use other well trained and social dogs to give the fast growing wolf pup the necessities only another canine can offer. 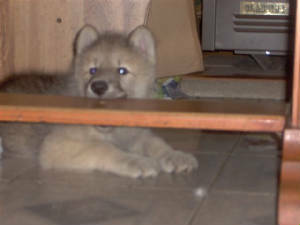 Wolf pups absorb (look to) the best and the worst of their environments, so if they are placed with spooky acting/skittish adults they will tend to also mimic such behaviors. 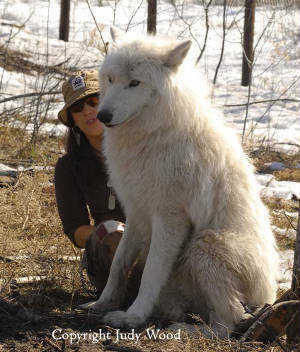 Wolf pups left with mom, like domestic dog pups are for 6-8 weeks, even if the dam is a social female, will tend to be fearful and extremely shy of all humans. 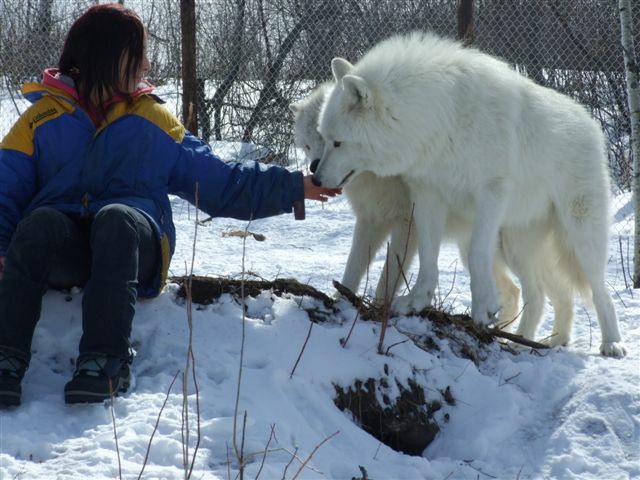 This strong trait is genetically passed onto pups for survival in the wild, but in captive situations fearfulness can turn to aggression and this is potentially unsafe. 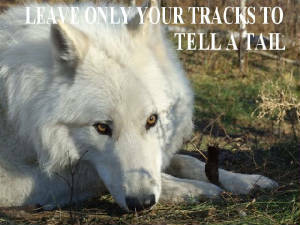 Many facilities are starting to realize keeping wild animals..wild acting, in captive situations can be a stressfully painful experience for the animals. 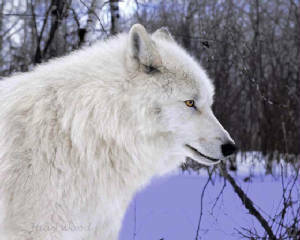 Though somewhat* tamed* enough to be safer and handleable (not domesticated) some other professional colleagues may argue the usage of this word, wolves that are hand raised and human bonded can never be returned to the wild, they serve a function in helping their own kind, as what people can see and learn about up close and in person they also wish to protect in surrounding natural habitat. 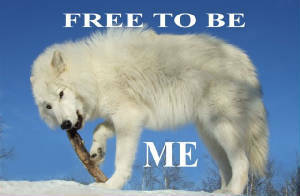 If You are a youth. 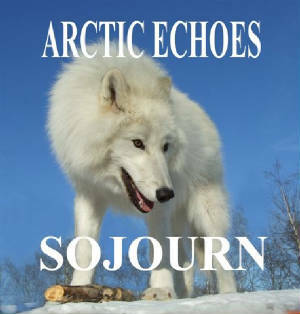 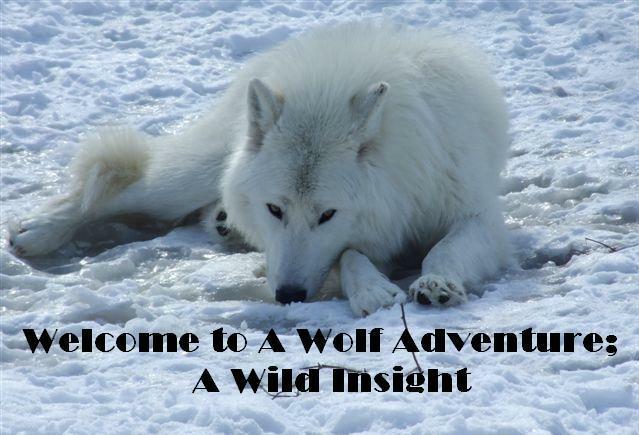 or adult wishing to know more about Arctic wolves or Arctic wildlife in general the following links will take you on a northern wild journey. 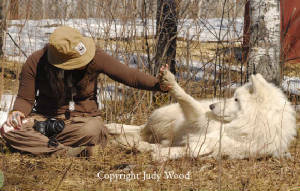 Sky and Legend High Five It! 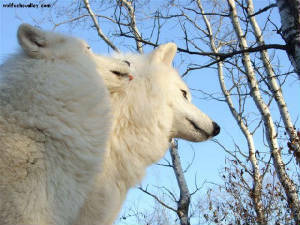 Skylar and Legend Sharing A Moment!